U.S. Army Lt. Col. Michael Deegan and U.S. Marine Corps Capt. Peter Tunis, CJTF-HOA judge advocate generals, and U.S. Army Capt. Daniel Sciapli, USARAF judge advocate general, traveled to East Africa to exchange of legal practices with the Tanzanian Peoples’ Defense Force. Here’s the final day-by-day recap of the visit to Dar es Salaam … (Read Day 1 and Days 2 & 3). On day four, U.S. and Tanzanian team members discussed rules of engagement, the law of armed conflict (LOAC) and the role of operational law attorneys in the U.S. military. The LOAC brief addressed the Geneva Conventions and the Hague Convention, strategic misconduct and the code of conduct soldiers are expected to follow in combat. Beyond the international policies that drove the conventions, the benefits of following LOAC were discussed through the lens of adding legitimacy to a nation’s position in a conflict, furthering that nation’s interests. The participants also weighed in on the rules of engagement and subjecting service members to criminal jurisdiction under the International Criminal Court. Maj. Shija Lupi, legal officer and military police commander, Tanzanian 603rd Air Transport Station, highlighted issues from one of his deployments to Lebanon. “ROE should also include cultural awareness for the area where the contingency [force] is going,” said Lupi. Tunis then gave an overview of Joint Operational Planning Process, ROE working groups, and the Joint Operations Center concept. The U.S. and TPDF also discussed application of the planning concepts to experiences of U.S. military attorneys at Combined Task Force – Horn of Africa and in Afghanistan. On the last day of the symposium, Mbindi facilitated discussion about the Tanzanian Military Justice System. This was followed by one final block of instruction by Deegan on the role of the staff judge advocate. The TPDF then conducted a ceremony concluding the week’s exchange of legal practices. Each TPDF judge advocate was presented a certificate by their U.S. counterparts for attending the military law symposium, while each of the U.S. participants was presented wood carvings made by local Tanzanian artisans. Tunis was deeply moved by the gesture. Deegan summed up the traveling contact team’s week-long endeavor. Two members of the Combined Joint Task Force – Horn of Africa legal staff and one U.S. Army Africa legal staff member traveled to East Africa recently to exchange legal practices with the Tanzanian Peoples’ Defense Force (TPDF) during the Military Law Symposium. During Day 1 of symposium, U.S. Army Lt. Col. Michael Deegan and U.S. Marine Corps Capt. Peter Tunis, CJTF-HOA judge advocate generals, and U.S. Army Capt. Daniel Sciapli, USARAF judge advocate general, were welcomed by Tanzanian legal officers. Here’s Part II of the day-by-day recap of the engagement between the two groups of military lawyers … (Read Day 1). Throughout the week, the U.S. and TPDF teams discovered ways in which both of their military law systems were largely similar, with many of the differences being in name only. Attorneys for the TPDF are normally called “legal officers” and their title changes to “judge advocate” only when they are assigned to work court-martials. Deegan and Tunis used personal experiences from previous cases to illustrate adultery and fraternization under Article 134 of the Uniform Code of Military Justice, along with relevant service regulations on fraternization. Maj. Shija Lupi, legal officer and military police commander, Tanzanian 603rd Air Transport Station, shared the equivalent TPDF policy. “Adultery is strongly prohibited. A court of inquiry would be convened and the soldier would be administratively released [in a case of substantiated adultery],” said Lupi. Sciapli took the baton for day three to discuss different types of claims and investigations. The TPDF listened to his experiences running a claims office in Iraq during Operation Iraqi Freedom and working as the Claims Commission for USARAF. Several of the TPDF also had extensive experience with investigations. Their system assigns the responsibility of being an investigating officer to legal officers, as opposed to the U.S. system, which appoints an officer who may seek assistance from a judge advocate. The TPDF then shared information about their claims system and some of the issues that arise operating in a coalition environment with international organizations. 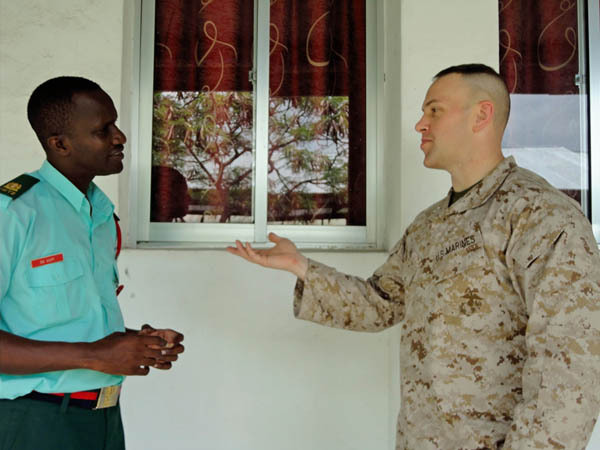 Another experience shared by the TPDF’s Lt. Noah Bonaventura Kong’oa illustrated one of the major differences between the Tanzanian and U.S. systems. As an example of the “mode of living” test, if a man lived the life of a Maasai warrior and went through the Emuratare ceremony (a rite of passage to become a warrior upon reaching puberty that involves circumcision), and he practiced Maasai traditions until he died, the customary law of the Maasai would apply to distributing his estate. 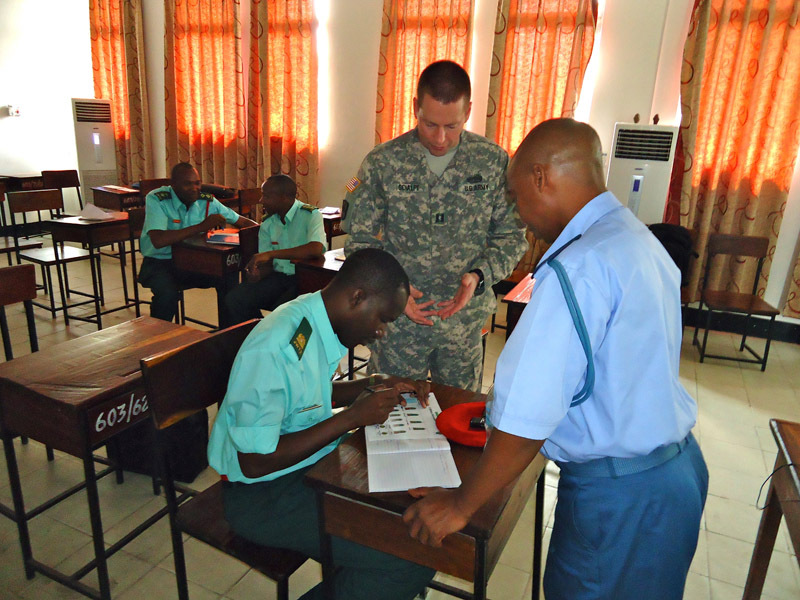 The Tanzanian legal officer helps make this determination for deceased service members. Legal assistance services in the U.S. military, however, do not extend into the probate process beyond creating wills. DAR ES SALAAM, Tanzania – Two members of the Combined Joint Task Force – Horn of Africa legal staff and one U.S. Army Africa legal staff member recently attended the Military Law Symposium at the Peacekeeping Training Center here as part of a traveling contact team. U.S. Army Lt. Col. Michael Deegan and U.S. Marine Corps Capt. Peter Tunis, CJTF-HOA judge advocate generals, and U.S. Army Capt. Daniel Sciapli, USARAF judge advocate general, went to Dar es Salaam for an exchange of legal practices with the Tanzanian Peoples’ Defense Force. 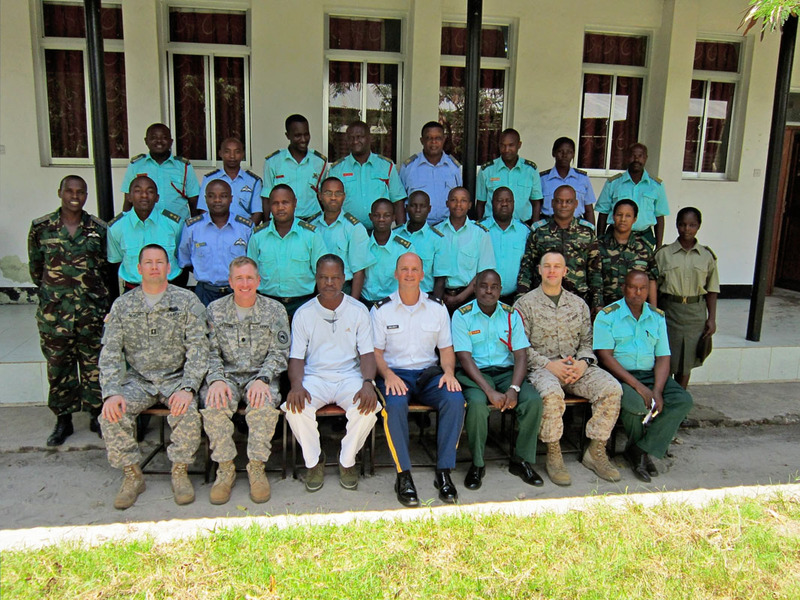 The team’s visit, which had been requested by the Tanzanian military, informed Tanzanian legal officers and aviation officers of U.S. military law, legal best practices, and the role Judge Advocate General Corps Officers play in advising military commanders on operational law and legal issues. The event highlighted discussions on investigations, introduction to operational law and introduction to military justice. When the team stepped off of the plane into the humid, 88-degree heat, they had some concerns and anxieties normally associated with visiting a country for the first time. How would they be received? Would their instruction be on point with what the Tanzanian military was looking for? Would there be language barrier issues? Most Tanzanians speak English as a third language, with tribal languages and Swahili as their first and second. On the morning drive through the buzzing metropolis, each city block was packed with thousands of Tanzanians conducting their morning commute on foot, bicycles, and in various rickshaws, cars, and ornately-detailed minibuses. When they arrived at the Peacekeeping Training Center, the team received a warm welcome from the TPDF. Tanzanian Lt. Col. Mbindi, his supporting staff, and the TPDF judge advocates in attendance quickly put one of the Americans’ main concerns to rest―they all spoke English. After a formal ceremony that included a speech from the installation’s commanding officer, everyone gave a personal introduction. “Having been away from my wife for the better part of six months, the TPDF’s introductions were very endearing. They triggered a response in my internal dialogue that was pushing me to express ‘I love my wife, too!’” said Tunis. Tunis gave the first block of instruction, which discussed examples of the U.S. process for training and educating judge advocates. For a U.S. Marine Corps JAG officer, this eight-year process includes getting a bachelor’s degree followed by a law degree, taking a bar exam, and graduating Officer Candidate School, The Basic School, and Naval Justice School. The Tanzanian model for the initial training of a judge advocate involves fewer steps. An individual who wants to practice law can go directly to law school upon finishing primary school, which is the Tanzanian equivalent of a U.S. high school. Deegan then provided instruction on how U.S. commanders can use JAGs―and not only in their decision-making process on legal matters. “JAGs should be used as military attorneys, but that doesn’t mean they can’t road march, learn to operate an armored vehicle, fire heavy weapon systems or participate in battle drills or exercises,” Deegan said. He stressed that JAGs do not merely provide legal opinions. “Training has taught JAGs not just the laws and statutes, but how to systematically approach problem solving,” said Deegan.